Since Matt Cutt’s recent remarks, we’re all a bit more self-conscious about guest blogging, aren’t we? Today I received an email, offering a guest post for my blog at RalfSkirr.com. The Writer Disqualified Himself By Packing His Offer In A Bunch Of Narcissistic BS. But don’t believe me, judge for yourself. Being a well-versed, veteran, techno-savvy & enthusiastic blogger, I would like to express my interest pleasantly to become a part of your eminent platform as a Guest Blogger. Indeed, on this platform, I would share & bring out my “know how” to contribute informative, inspirational & exclusive blog posts for the end-readers. I ensure that my write-ups on the latest web development technologies, new trends & innovations for diverse industrial sectors will enhance knowledge as well as keenness of the readers. I’m sure that you will love to read my proffered featured blogs & you would emphatically admire my quality-rich, precise, keyword-oriented & search engine friendly write-ups on different topics on your website. The blogs, offered by me for your website, are absolutely free of cost. And as rewards, I just would like to gain backlinks for www.csschopper.com from your end. Please Note: Hopefully, I will get your reply as early as possible (expected: “within 3 days”), else my forwarded content will be sent for publishing on the other websites. I think that I have made everything crisp & clear. If you have any disarray or query regarding the aforesaid points, you can revert me for the same freely. Eagerly looking for a convinced response from you on my requested blog proposal! Hey, Despite Being Terrible, It Actually Worked! Csschopper got their back link, after all. It’s a nice site, and assuming their work results are professional [which I don’t know], the pricing is good. who doesn’t spam blogs with generic copy-and-paste letters. who doesn’t write emails that make you fall from your chair laughing. Let’s turn this into something useful. Or even better, that get a favorable response by the blogger! Don’t hype yourself. It’s embarrassing at best, and wasting time. You don’t need to tell a blogger you’re Pulitzer material. Give him links to your sample posts, and he will see what you have to offer. Talk about yourself as little as possible. Talk about what you have to offer for the blog. Keep it short. Bloggers don’t have time to read long ramblings. Especially from people they’ve never heard of. Give links to sample posts. That’s about the only thing the above letter did right. Don’t threaten with deadlines, and with giving your precious post to another blog. Hello? You are the one, who wants something from the blog publisher. The blogger didn’t beg you to offer him your post. Don’t ever do this. Instead, you should be enthusiastic to write a post exclusively and tailored for this blog. Use a word editor with grammar- and spell-checking. Some of the grammar mistakes in the letter above could have been avoided using Microsoft Word’s automatic grammar checker. You don’t even need to pay a proof reader to do that. Make sure your topic is a perfect match for the host blog. I was offered 3 posts about web design. It’s not far off, but it’s also not a truly excellent fit.Explore each blog you want to win as guest blog platform. Make sure you understand what exactly it is about. Mismatch of topic is the number one reason I reject guest pots for InternetBusinessMastermind. Don’t send copy and paste letters. Nothings says ‘I’m an SEO spammer’ more than sending generic emails. The email above didn’t even include my name. 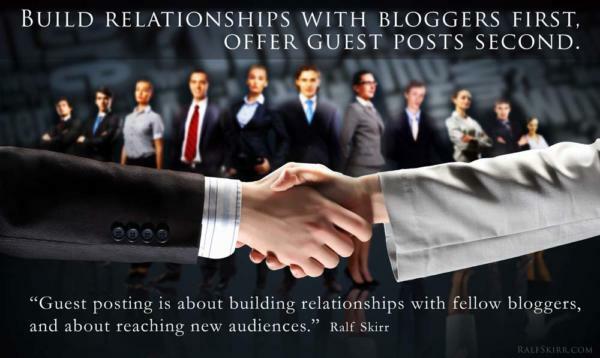 Build relationships with bloggers first, offer guest posts second. If you remember anything from this post, remember this!Don’t drop guest posts to random blogs like a bird randomly drops its business on its way flying south. Don’t even offer guest posts to blogs you don’t read frequently and you don’t have a relationship with. This is the type of SEO that gives guest blogging a bad name.Guest posting is about building relationships with fellow bloggers, and about reaching new audiences. Connect with bloggers in your niche. It has numerous advantages, besides getting guest blog opportunities. Use blog comments, blogging communities, and social media to get in touch with bloggers. Once you’re already connected to a blogger, you won’t fall into the trap of sending a copy-and-paste letter. Have you ever seen such a ridiculous proposal?